Papa Roach has released a surprise music video for "None of The Above", the eighth music video released from their latest album "Crooked Teeth". The video, which was shot on location at Beaufort Castle in Luxembourg while the band was on tour in Europe, features the DanceXperience ballet troupe. It was directed by Bryson Roatch and choreographed by esteemed urban dance choreographer Alex Lopes. "We actually wrote "None of The Above" near the end of recording "Crooked Teeth""says bassist Tobin Esperance, "We were going for a classic rock-sounding anthem, juxtaposed with current, contemporary, sounds and taking a rock anthem to a younger generation. 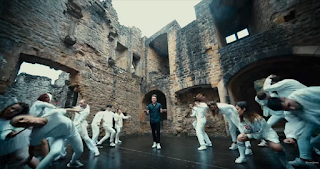 Bryson had this great idea of going to a castle while we were on our European tour and then he made us even more excited by telling us that he could get this song choreographed and he delivered on all counts."